Maybe it’s because I am somewhat vertically challenged, but when I am exploring a city I always find that my eyes are drawn upward. Seeking the light, and the angles of the rooflines. But sometimes it leads to a pleasant surprise. This urban greenery – trees and shrubs growing on terraced roofs and balconies – is from an apartment block on Boylston Street, in Boston, Massachusetts. But you can find similar gems in cities around the world. Just make sure that you lift your eyes to the skyline! I took this photo while strolling around Boston on a Sunday morning. I was in town for a conference related to my day job, and took advantage of some down time to garner some wonderful material for my art. This image has called to me for a long time, but this is the first time that I have been really happy with the result. 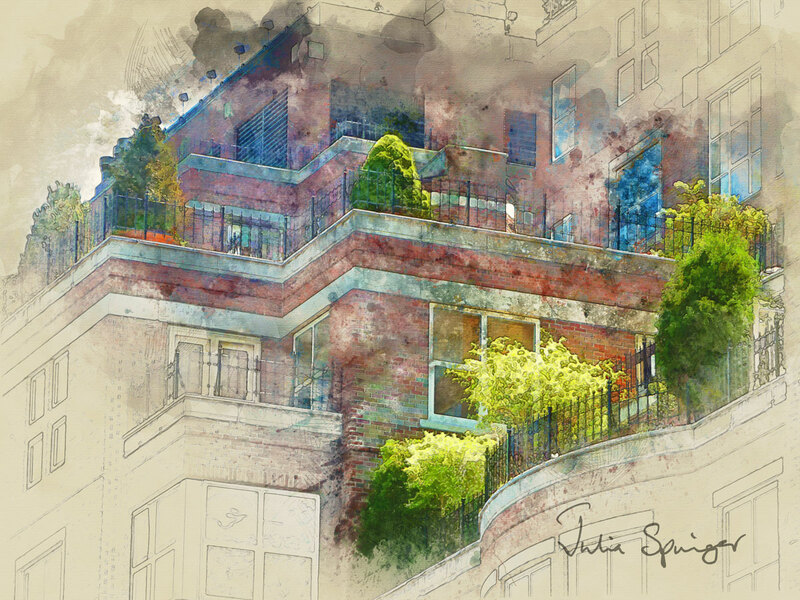 I used some digital watercolor brushes to bring out the colors, and combined the colored image with a stylized pencil sketch to emphasize the architectural background. Added some directional lighting, et voila! Hope you enjoy this glimpse of nature today. Please share your reactions below, and use the buttons to share this post with your friends on social media.